1. Go to WEB GUI -> Basic Settings -> Call charges -> Output format. 2. Select the necessary format of call records. The compressed output must be DISABLED. 3. Select the output format "LAN-TCP-Client". 4. 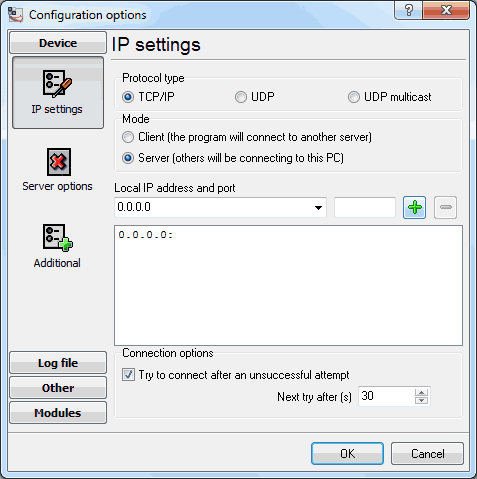 Specify the IP address of the computer with our software in the "TCP-Client" field. 5. Save and apply the changes. Advanced PBX Data Logger should be configured to the TCP server mode and listen on 0.0.0.0:7000 (see below). The port number should match the value from the SMDR settings in Siemens Unify Openscape Office.